Zivame is running Buy 1 Get 1 free offer currently. Large varieties of bras, briefs, nightwear and comfort wears are on sale. Zivame is India's No 1 lingerie destination for women. It features 5000 styles in 100 sizes from 50 brands. Zivame is currently catering to over 3 lakh women across India. 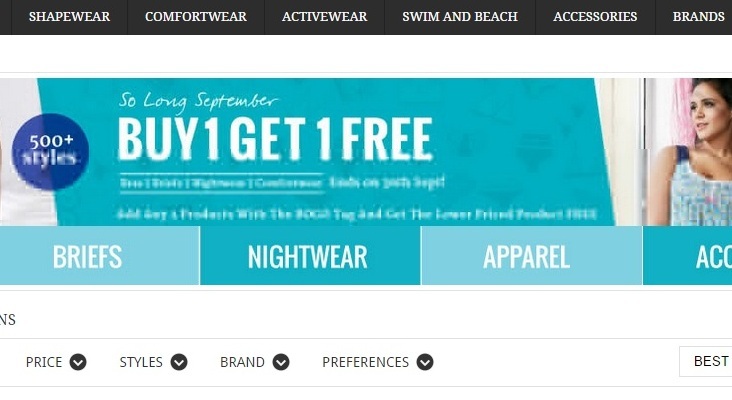 How to avail this Buy 1 Get 1 free offer from Zivame.com? 1. Click here to visit Zivame.com website offer page. 2. Add any 2 products with the BOGO tag to cart. You can get the lower priced product free. 3. Buy the products and you will be charged only for the higher priced product. Lower priced product is absolutely free. 1. Offer is only applicable on products with the BOGO tag. 2. Only lower priced product is free. Higher priced product will be charged. 3. Offer is available on 500+ styles. 4. Offer is available on large varieties of bras, briefs, nightwear and comfort wears. 5. Offer ends on 30 September 2015.